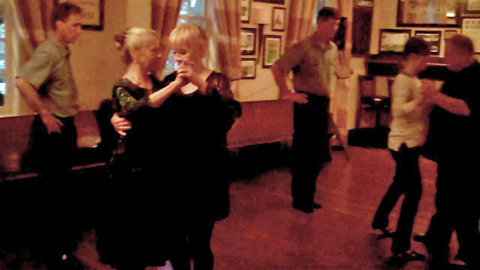 Although I’m not a tango dancer, all I now know about tango came from watching and talking with Alberto and Valorie. This knowledge was piecemeal and interpreted on the slant. Nevertheless, sometimes the perspective of an attentive bystander has its own merits, taken in from a calm distance. In a way, it’s as though one is looking on to what’s happening in the same sense we might imagine angels looking onto the human condition. And it’s from this vantage point that I want to say a few things about Alberto Paz. What I admired most about Alberto was his single-minded fervor and dedication to tango. The passionate dream he shared with Valorie was to create a vital tango community in New Orleans, their adopted home. Alberto’s vision was steadfast and ongoing and in this regard, he was a true American milonguero. And to this let me add that, yes, he often seemed blunt and demanding. However, for the most part, it was in his nature to be a keen and ardent taskmaster. He could endlessly argue points finer than silken threads…or defend matters as deep and wide as the Sargasso Sea. But what fueled these apparent excesses was his deep love of tango. And by the same token, this abiding love gave rise to unexpected and unaccountable bursts of generosity. I cannot count the number of times I witnessed his gentle kindnesses and good-natured humor. When he was operating in full-tilt overdrive, these teeter-totter lifts and dips of extremes were amazing to observe. Yet all of it was worth it in the long run. And those who persevered and paid attention really learned and happily improved as dancers…and as human beings. Even if one didn’t fully attain what was expected of him or her, one appreciated how high bars can be set and how beautiful the art of tango can be. This makes sense because Alberto had great teachers himself and was then inspired to responsibly carry on a tradition that included everything: the dynamics, the music, the history, and the poetry… Everything! When I first saw Alberto and Valorie dancing together, all of these important aspects were on display. I saw them interpreting the music they heard. I recognized how they adored the pauses. I marveled at how their movements achieved balance in their turns and leans. Most of all, I witnessed how Alberto led Valorie to disclose her skills while minimizing his. (Which I later learned is the way to do it.) If the woman partner is made to look good, the dancing will look good…and Alberto and Valerie looked that good. It was a sight to behold. From time to time, I thought that Alberto had a lover’s quarrel with the world of tango…. Again, this was probably due to his ardent and complicated temperament. He knew there would be disappointments—disappointments with others and disappointments with himself. But he always struggled with this aspect, knowing it came with the territory. Nevertheless, he felt responsible and obliged to pay the dues of tango’s demands. This is why he put his heart and soul into it and gave it everything he had! Most of all, he was committed to being as good and true as possible rather than settling to merely look good and be false to one’s sacred ideals. This is also why he wanted every aspirant to love tango as much as he did. This is why he wanted to show us ways to the heart besides just ways to the feet. He wanted the lyrics and the lyricism. He wanted it all. Whenever he said it, a glint sparked in his eyes—the pronunciation, respectful and loving, the equivalent of a kiss. And as mentioned earlier, Valorie Hart—his dedicated partner in living and loving–was the steadfast accomplice of their shared dream…in their dancing…and in their teaching. And both fully accepted the challenges and chances the Tango Life affords. Both were willing and able to move as one to its irresistible music and calling. Uttering and hearing the words now being spoken and shared right now makes me realize how grief can paralyze people and make them feel helplessly unqualified to speak about abject losses and possible future gains. Yet we try. We falter. We try again. Between Alberto’s entering and leaving this world, besides the love of his children and grandchild, two primary forces energized and inspired his soul: Valorie and Tango. The cliché is that it takes two to tango and dancers who truly and deeply embrace this enchanting form look for signs to find their perfect partner. Well, Alberto discovered these signs when he found his precious Valorie. Together they profoundly embraced the art, striving to be exemplars as they taught and shared tango’s fierce and nourishing beauty. When a soul as uniquely loved as Alberto disappears from our landscape, words cannot capture the sensations aroused by such an unexpected and abrupt disappearance. We are, after all, accustomed to the countless appearances and disappearances of persons sharing our daily lives. And if and when we are told that—“No! No! No! This time they’re really gone!”… We protest. We protest because the spirit of this person, this presence, remains within us. And we have faith that this spiritual presence can be revived to sooth, console, and be with us in the here and now. With this thought now fresh in our minds and hearts, for a precious moment, let us imagine and remember Alberto dancing and teaching students eager to understand the spirit of tango. Let us imagine and remember Alberto encouraging them to dance in the way it was meant to be. They say there is a Paradise in Heaven, but does it matter? My wish is for one more joyful tango with my beloved Valorie in my arms. Let THIS be my Paradise! And so it should always be. People who just yesterday played with us on the dance floors around the San Francisco Bay Area suddenly begin to have babies, others die in the most tragic of ways, and a new breed of playmates give us the eye the way we looked at our parents when they shook their heads watching our tastes and preferences. Lucy has morphed into Ethel, and Ricky is now Fred.It feels like just the other day when we made the decision to step aside and throw our support to a former disciple turned tango entrepreneur. In return we’d get the treatment and respect extended to visiting celebrities, and occasionally would be invited to do a workshop or two, or perform at some special occasion. In between we had to deal to unexpected health challenges, one that almost marked the end of a road. Nevertheless, one year after our last foray as milonga hosts, we returned to the former Taqueros restaurant, now the upscale Irish House. It was Sunday, the week after the Saints fumbled their 2011 Superbowl hopes in San Francisco, allegedly affected by the same malady that some New Orleanians who venture out of the Parish line suffer, the fish out of water syndrome. What’s great about this city is that nobody goes ballistic, there is no mourning period, they put their Saints paraphernalia away and resume the countdown to Mardi Gras. We had this idea of appealing to a new group people so the critical mass of dancers in the city would increase, and we were expecting and prepared for a great introductory lesson and an introduction to tango parties to many newcomers. I felt like 1997 again, except I had long hair back then. Imagine our surprise when face after known face began to file into the upstairs room on time for the multilevel lesson. They changed their shoes and stepped on to dance floor forming a circle. It really felt good and it changed our focus immediately. We presented a very nice combination consisting of a turn to the left right after the salida in cross feet, then showed a similar salida followed by a turn to the right, and finally taught them how to concatenating them together for a longer and challenging move. After the lesson, we danced almost four hours non stop, a new after Katrina record. The virtues of dancing at a public place become evident one more time. People made their choices of whom to talk to, whom to dance with, whom to drink with, and whom to sit with. The place really look like (not, I’m not going to say Buenos Aires), the place look like the kind of place where adults go to socialize with other adults. Even a group of youngsters put some of us to shame, by occupying a table, ordering diner and drinking champagne. We really appreciated every single person who took the time to come, dance and have a good time. When it looked like we were destined for the geriatric hall of fame, we heard the music, looked at each other and got up to dance another tanda. The December 1994 issue of the Argentine tango magazine El Firulete reported the first celebration of the Day of Tango outside Buenos Aires. 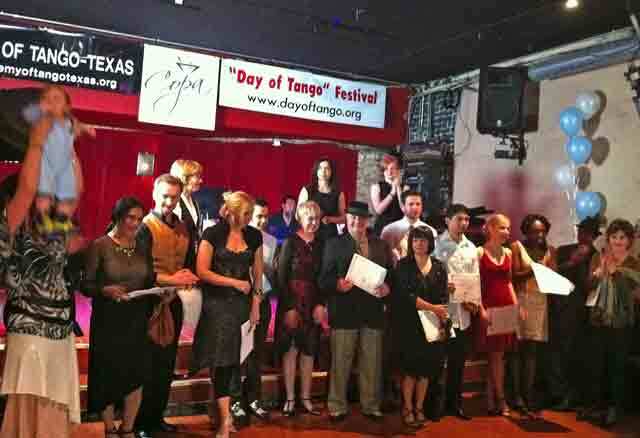 Billed as the International Day of Tango, the event took place in Fremont, California at a place called La Cueva. Representatives of the Bay Area Tango Association, and event executive producer and publisher of El Firulete Alberto Paz, took turns to read from various essays about the lives of Carlos Gardel and Julio de Caro. December 11 has been the Dia Nacional del Tango in Argentina since 1977 when it was decreed as such in commemoration of the birth dates of the creators of the voice and music of tango, Carlos Gardel and Julio De Caro, respectively. The person behind the efforts to establish a National Day of Tango was Ben Molar, a poet, editor, maker of stars and pop stars and patron of the cultural life of Buenos Aires (named distinguished citizen of the city), head of the Academy Porteña of Lunfardo and the Academia Nacional del Tango.This year, the Academy of Tango – Texas, an Austin-based non-profit, celebrates the first official “Day of Tango” (Dia del Tango) festival with live performances by area tango instructors, professional performers, poets and musicians. 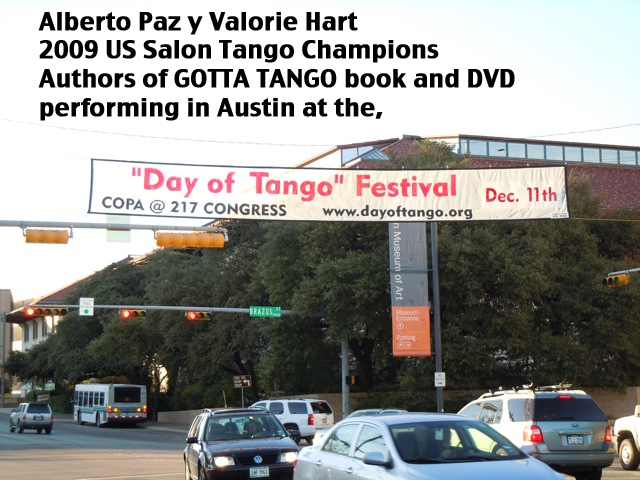 The Mayor of Austin, Lee Leffingwell, recently issued a Proclamation designating December 11th as the Day of Tango, and the State of Texas Governor’s office has also recognized this date as a momentous event. With the approval of La Academia Nacional del Tango de la Republica Argentina, The Academy of Tango-Texas is proud to bring this momentous celebration to Austin! The Copa Bar and Grill is located in the heart of downtown Austin in a very old building, offering the sights, sounds and flavors of Latin America. 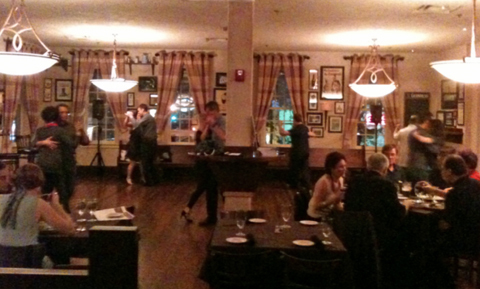 It features a diverse lineup of live music, and on Tuesday nights it is the home of Always Tango weekly milonga. As we arrived, we were directed to the second floor where they had set up the room for vendors (shoes, dresses,and books) and a food table catered by Buenos Aires Cafe. Shortly thereafter we came down to the ground floor salon where the festivities took place. The first hour was devoted to introductions, readings on the history of tango, poetry and an Argentine folk group dance in typical native attires. During the second hour, dedicated to the Golden Era, hosts Alicia and Juan Carlos took turns to dance with various members of the community followed by a group performance by students of Daniela Arcuri. 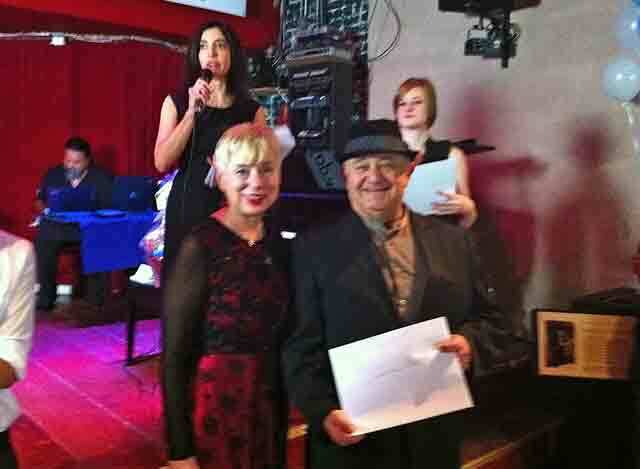 Gifted musician Glover played several tango classics on the piano and a short segment of open social dance followed. At the 3 o’clock hour, a piano performance by Renee Casarsa took the audience through a quick trip back in time with compositions like El choclo and El entrerriano to Piazzolla’s Verano porteño. Then it was time for the Evolutionary tango performances by several hot couples that included Monica and Gustavo, Julia and Jerry, and ourselves. The evening continued with more poetry reading, singing, and musical performances followed by Neo Tango performances (whatever that is because it all looked like So You Can Dance meet Forever tango) highlighted by Judy Foster, former disciple from San Antonio, and talented Daniela Arcuri. A final number featuring heavily tattooed dancers didn’t seem to meet the climatic expectations for a fair ending to an incredible day, but it got the mostly local audience whistling and cheering. To say that Alberto and I are excited with the way the upcoming Thursday Argentine tango sessions are shaping up, would be a major understatement. Really. Can’t tell if the moon is in the seventh house and Mercury aligns with Mars, but it really feels like 2000 again…For those of you who might wonder why 2000 is significant, it is because that is the year Alberto and I moved to New Orleans and became the resident tango teachers and promoters. 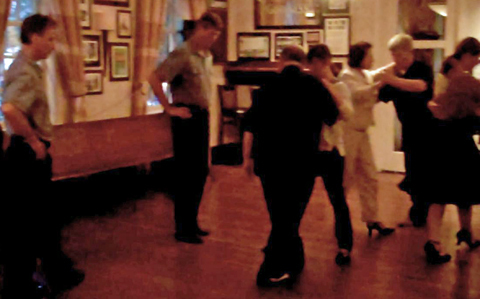 We had our own dance studio (The House of Tango), taught several weekly classes, and over the course of the years right up until Katrina, hosted five acclaimed tango festivals in New Orleans. We also produced tango shows, and performed in many showcases. After Katrina, things changed, even in our happy little tango world. But now, with Alberto’s health restored, and the city’s rebirth in full swing, we are ready to resume where we left off. 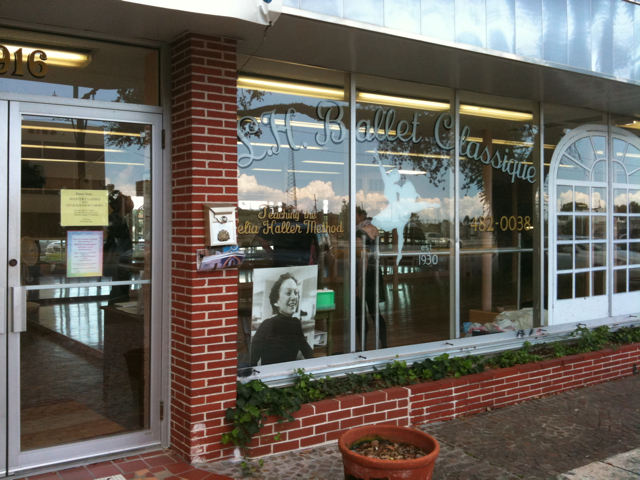 We will be teaching weekly classes again at a beautiful ballet studio on Canal Street. Fundamentals are not something we learn today and then discard tomorrow. Accomplished musicians do scales. Accomplished athletes do drills. Accomplished ballet dancers do daily classes at the barre. Accomplished artists draw every day. Accomplished writers write every day. This is how we use our fundamentals. They are the tools that we use every day as tango dancers. The more experienced we become, the more our fundamentals will look so spectacular that they will not be recognized as such by the untrained eye. Our classes will be two hours long. Every week we will begin with a warm up, something we call Tango Fitness that drills technique. This session will be led by myself. Then, Alberto and I will introduce a particular aspect of technique which will be pertinent to the topic chosen for the evening’s lesson. Tango is the ultimate touch dance between a man and a woman. It is a safe form for experiencing human connection three minutes at a time. It is an exercise in mutual respect and consideration for both partners as they both embark on a journey that requires full participation and cooperation from both ends of the partnership. No partner needed. Multiple lesson pass don’t expire unless we do first. We have been in New Orleans now more time after hurricane Katrina hit than before. The way time squeezes through our mind resembles the way the flood waters came in and went leaving very little evidence of the biblical disaster that washed away lives, property and hopes during the hot and humid first half of September 2005.About six months ago I had a close encounter with my mortality that left me with the unsettling feeling of realizing how fragile life really is and how quickly, with the speed of light, the flame of life can go out. I don’t know if things happen for a reason, but I know that they happen. Deep rooted values, prejudices and attitudes have changed, like for example the hope that sooner or later people will give us public credit for all the wonderful things we have brought to their lives. The reality is that everyone is busy with their efforts to fulfill their own needs and desires. Just the other day a wonderful young woman asked Valorie if she was the person who recently danced at an exhibition because she had recorded the dance and sent it to her mother. She was one of many young people having a good time at a home dance party. We know that on a good day, we can mix it up with the younger set, and go on like the energizer bunny while a lot of young feet, relieved of their shoes, throb laying on a couch. 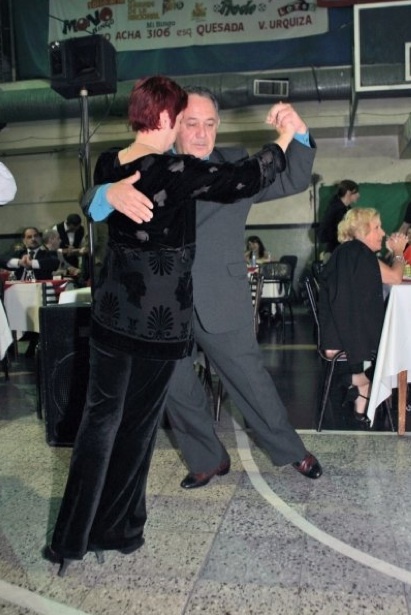 The secret of course is that we know what we’re doing, and have worked very hard over the years to dance tango, milonga and vals cruzado, the way it has been danced in Buenos Aires since the 1940’s. As a matter of fact, we are too modest to remind us that we can teach anyone how to do it, and that we even have written a reference book on how it is done. We didn’t invent it, we learned it from authentic teachers, masters, only a handful of them, avoiding to fall by the mistaken notion that diversity makes up for better dancing. That’s why we don’t laugh nervously to hide the fact that we really don’t know why we’re doing what we just saw somebody else do. I know we don’t. Our happiness is because we love, respect and cherish the ritual of the tango and all the exhilaration that comes with it. And we’re ever so grateful that we have opportunities to dance, and that we can still dance. I wonder what the lovely young girl would say to her mother when she sent her the video of our dancing. “I hope to dance like that when I grow up?” Of course not. I joke, I smile, and I say to myself, wouldn’t have been nice to document, archive and file away many of the wonderful memories pre-Katrina to be able to show it to those who came much later? To even remind us that no one can take away what we have danced. A poet once said, and I paraphrase, that a populace who doesn’t have myths is doomed to be frozen to death, but a community that is not aware of its past, myths and legends included, is already dead. A couple of years ago, Buenos Aires cable channel Solo Tango commissioned a documentary about tango in New Orleans for broadcast in the Spring of 2007. They choose us to produce a living testimonial of the wonderful tango life we brought with us to the city of New Orleans in the year 2000. To show how things were before the levees breached after Katrina, flooding the city, and washing away lives, property and hopes. Inspired by the candid question of the beautiful young girl, and excited by the desire of a group of youngsters to get involved in promoting tango activities in the region, we share this living testimony as a loving tribute to all those who never came back and also to those who have yet to come. To the ones who were part of those wonderful pre Katrina days, thanks for the memories. Not long ago, tango in the US was one happily dysfunctional family. We were young and wild and we loved to visit all our brothers, sisters, and cousins at a time when tango traveling was not yet an option for the grand majority. We had begun the life of the traveling teachers in 1996 going up and down the state of California. In 1998, some tango in-laws had opened the only salon in the Midwest devoted exclusively to the promotion and preservation of the Argentine tango. A series of life circumstances led them to work very hard to renovate and decorate a 4,000 sq ft studio on a property where an A&P supermarket once existed, before a laser tag game room, and a martial arts studio did business at the premises. One balmy Chicago night, precisely Saturday, June 6, 1998 we culminated a week long series of workshops with a memorable tango party at Tango nada mas. As weeks turned into months, and months turned into years, the family grew apart, feuds developed, and people went their separate ways creating their own micro communities, shoving the welcome signs in the attic of oblivion. As time went by, many memories vanished, including the overwhelming elegance of Tango Nada Mas, the carefully selected tango music, and the way we felt for these members of our tango family for whom we had the most sincere affection and friendship making their happiness ours. Then, just the other day, looking for something else, it was such a enormous surprise to find a videotape containing some great memories of our Chicago visit that we had long forgotten, but after watching it, we’re almost sure that Chicago will never forget… Just in case, here is reminder. It’s pretty amazing to think that one week ago I had reluctantly agreed to have an angiogram, knowing quite well after a couple of years of denial what the photos would show. The “test” would be immediately followed by an actual angioplasty, which consists of reaching the blocked arteries with a catheter and craftily opening them up with a tiny balloon followed by the installation of a wire mesh (stent) that prevent the artery walls from collapsing again.As we took the first spins last night at the milonga, I definitely could tell the difference of feeling my heart receiving and pumping unrestricted flows of blood, and as the night progressed happiness trumped fatigue while our attention focused on next day’s announced Night of the milongueros.